Although I gave different versions of mücver recipes so far, I haven't posted "the" mücver recipe. In Turkey mücver is usually made after stuffing zucchinis, using the carvings. But it is a delicious dish on its own featuring all the fresh herbes of summer. -Put grated zucchini in a colander. Sprinkle with salt and let drain for 10 minutes. Squeeze and place in a bowl. -Mix well all the ingredients except for flour and frying oil. -Add flour in slowly and mix well. -Heat oil in a frying pan. On medium drop scoops of mücver mixture in hot oil. Make sure they don't touch. -Fry them on each side until golden brown, 4-5 minutes. -Drain excessive oil by placing fritters on paper towels. -Serve with plain yogurt or garlicy yogurt sauce. For garlicy yogurt sauce beat every 1 cup of yogurt with 1 clove of minced garlic. When I made mucver last time, I put hellim cheese besides feta and grated carrot. Hellim cheese really goes with zucchini. I do use grapeseed oil for frying. It does not absorb the oil because grapseed oil has very high smoking point. This is my absolutre favourite way to enjoy our summer bounty of zucchini. I made these tonight and they were fantastic! I used potato flour to make them gluten free, and served them with some garlic yogurt sauce. Thanks for the recipe! Have you ever tried to bake these instead of frying them? I love all the herbs in them! ycurl-hellim sounds really good; I have to look for some at the Turkish market. Gaile-I'm glad you like them! 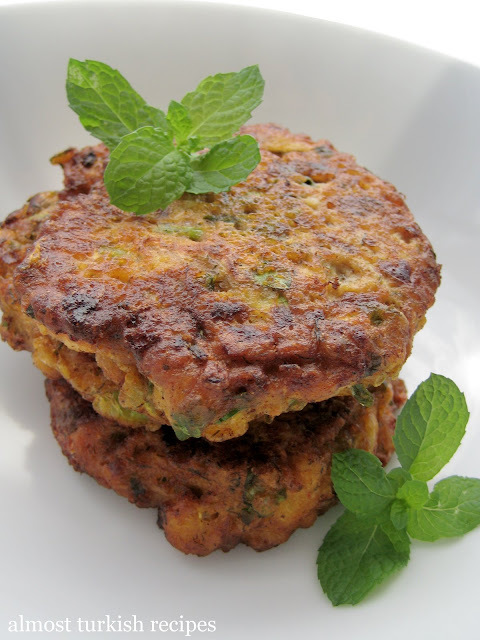 Simona - I have a recipe for oven baked zucchini fritters on the blog, which I love, but I still think fried ones are more delicious. 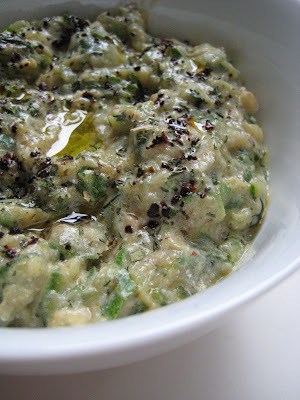 This is how I make mucver too, one of my favorite Turkish appetizers. I make it pretty often but end up eating it all by myself as kids refuse to eat anything zucchini made:) Great recipe! I bet the zucchini gives these a nice texture. 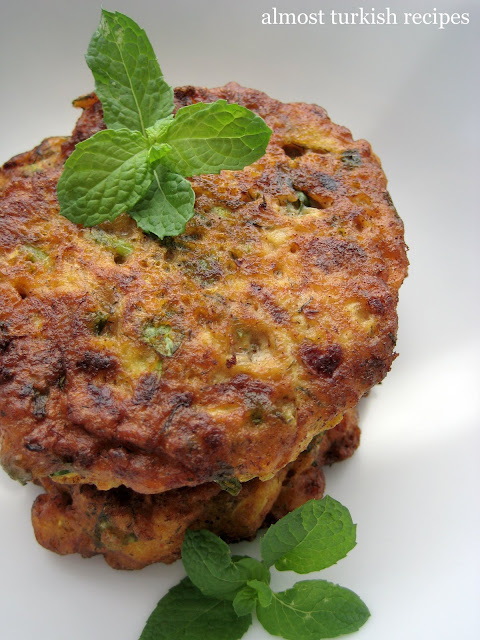 these are fritters are one of my favorite ways for using zucchini- and your picture is beautiful. I did try baking them but it wasn't as good. Can this be made without cheese? Is there a good substitute for cheese? Shiva, you can make them without cheese; wouldn't be a problem. Thanks so much for this, I just made this yesterday for a group of 20 Turks (the hardest critics! ), and it was a hit! I actually completely forgot to add the cheese (it was in the fridge the whole time), and I added some basil to the mix. For the yogurt, I added an extra clove of garlic and a VERY small amount of the rosemary olive oil that I make, and it was AMAZING. I already forwarded this on to three other people last night. Thanks again! This is fantastic! My Turkish mothers recipe is only slightly different. I used up our dolma trimmings and the monster zucchini I have in my garden. I had to work fast as the water from the zucchini started to release at the end. We added a little more flour to thicken it. Very Tasty! Why is facebook page unavailable? It would be good to have all these recipes on facebook fan page, easy to access. This truly looks like heaven on earth. I had tried a few zucchini recipes myself: www.stefkestens.blogspot.be but so far nothing can compare to yours. Congrats. Won't be long before I try it out. Might were very sloppy. should I add more flour? Hi Christine, the batter is supposed to be runny. If you add more flour the mucver will be hard. Did you squeeze the excessive water after grating the zucchini? Is this one and a half cups of flour? That's what I used and they came out heavy - more like pancakes than fritters.